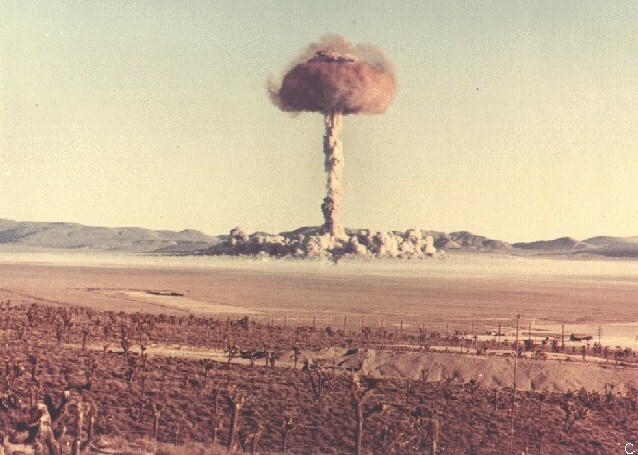 The Cold-War inspired accelerating tempo of nuclear weapons activity led to the inauguration of more complex joint test operations between the Department of Defense and the nuclear weapons labs (at this time consisting only of Los Alamos). 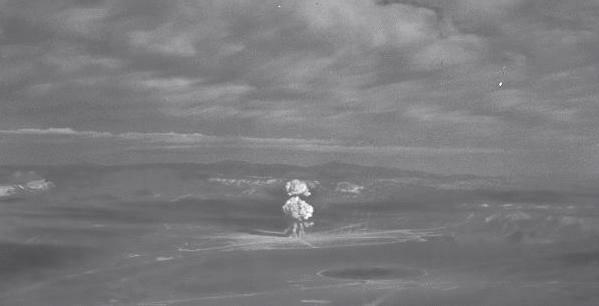 The previous test series had either been run by the DOD (Crossroads) or Los Alamos (Sandstone, Ranger, and Greenhouse). 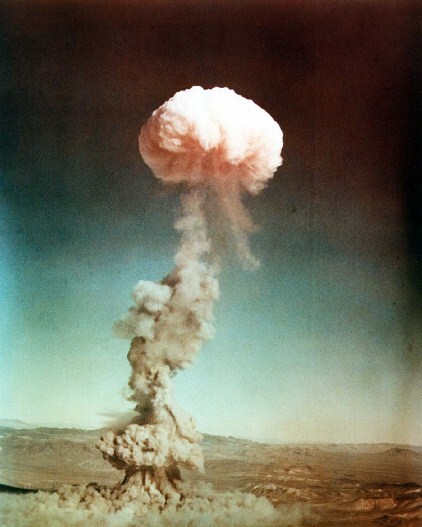 In late 1951 two test series were held together for the first time - Operation Buster (conducted by Los Alamos) and Operation Jangle (conducted by the DOD). 7800 DOD personnel participated in Buster-Jangle, 6500 of them troops who conducted field exercises in conjunction with the tests. These were the first such field exercises conducted in the United States proper. 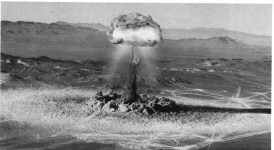 Buster-Jangle was held at the Nevada Proving Ground (later NTS) and had a number of objectives. The Buster series was primarily a weapon development effort. A number of pit configurations were fired in a Mk-4 high explosive assembly to collect data for weapons design. In addition the TX-7E design was proof fired (leading to the deployment of the Mk7 light weight bomb). The DOD also particpated in one of the Buster tests conducting the Desert Rock I exercise during the Dog shot. 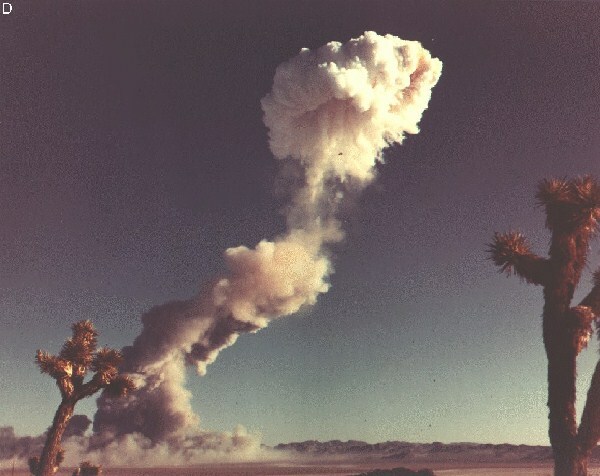 The Jangle series evaluated the usefulness of atomic weapons in cratering using ground-level and sub-surface bursts. 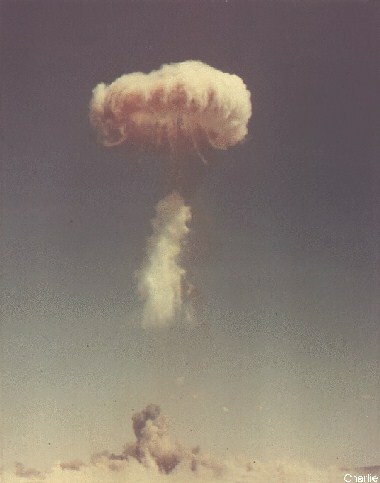 The Desert Rock II and III troop exercises were held in conjunction with these tests. 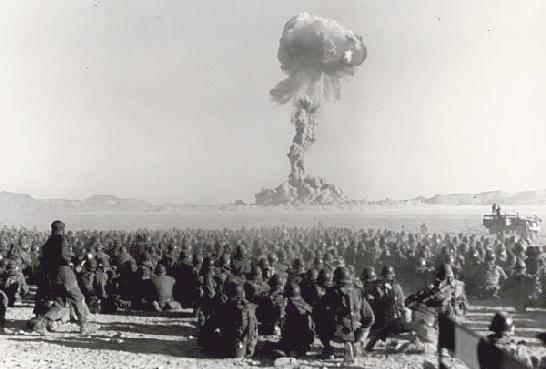 The purpose of the Desert Rock exercises was to gain experience in operations Conducted in a nuclear combat environment. Buster-Jangle released about 10,500 kilocuries of radioiodine (I-131) into the atmosphere (for comparison, Trinity released about 3200 kilocuries of radioiodine). This produced total civilian radiation exposures amounting to 7.4 million person-rads of thyroid tissue exposure (about 2% of all exposure due to continental nuclear tests). This can be expected to eventually cause about 2300 cases of thyroid cancer, leading to some 120 deaths. Chart of fallout exposures from "underground tests". From National Cancer Institute Study Estimating Thyroid Doses of I-131 Received by Americans From Nevada Atmospheric Nuclear Bomb Test, 1997. Go to the National Cancer Institute and get the full report. 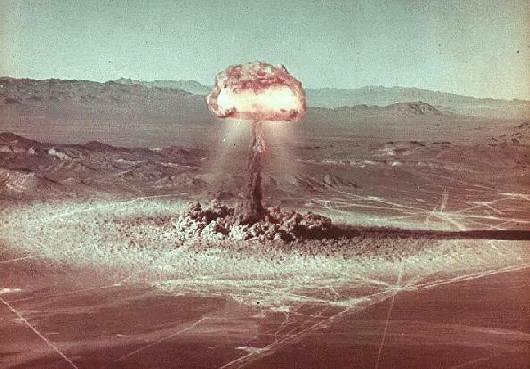 This was a test of the Petite Plutonium fission bomb, designed by Ted Taylor. It consisted of a standard 60 inch, 10,000 lb. implosion system with the plutonium core reduced to what was estimated to be close to the minimum amount of fissile material for an appreciable yield. This was the lowest yield design yet tested, with a predicted yield of only 200 tons. 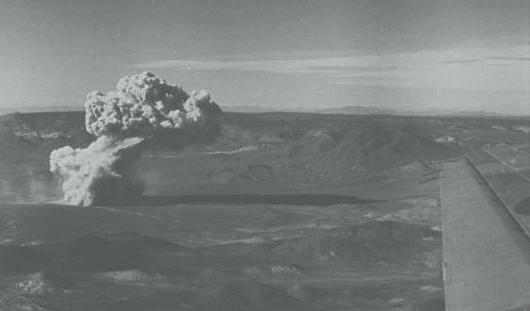 It was a fizzle - the first actual failure of any U.S. nuclear device (the 18th exploded by the U.S.), and the first known failure of any nuclear device. Rather than being a sign of ineptness, this failure was indicative of the increasingly aggressive (and thus risky) U.S. experimental approach to weapon development. It established a close lower bound on the minimum amount of plutonium that could be used in a weapon to produce a significant yield, an important benchmark in weapon design. This was inadvertently a "zero yield" test. The device achieved supercriticality and produced detectable nuclear output, but the energy produced was negligible compared to the high explosive used. The tower was damaged but largely intact from the test. The first attempt to fire this device (on 19 October) was a true failure - nothing happened. The problem was traced to the control circuitry. The test device, designated "LT", was a Mk 4 bomb assembly consisting of a plutonium core without a uranium tamper. The expected yield was 3-8 kt. The test device, designated "PC", was a Mk 4 bomb assembly of a composite uranium-plutonium core. The expected yield was 12-15 kt. The test device, designated "NF", was a Mk 4 bomb assembly of a composite uranium-plutonium core. The expected yield was 18-25 kt. 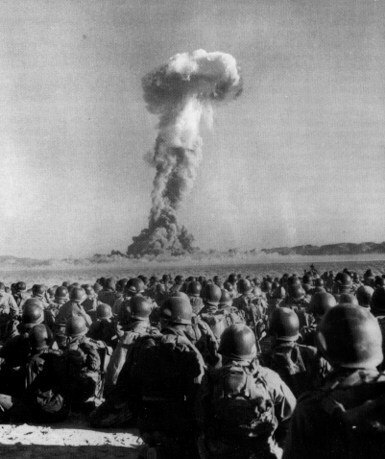 Desert Rock I - the first U.S. nuclear field exercise on land was conducted in association with the Dog shot. In the weeks before the shot the assembled troops (from the 188th Airborne, 127th Engineer Battalion, and the 546th Field Artillery Battalion) dug field emplacements to simulate a defensive deployment southwest of the shot location. The troops observed the shot from a point six miles from ground zero, were transported to the defensive emplacements to view the weapon effects, and then conducted maneuvers in the area. 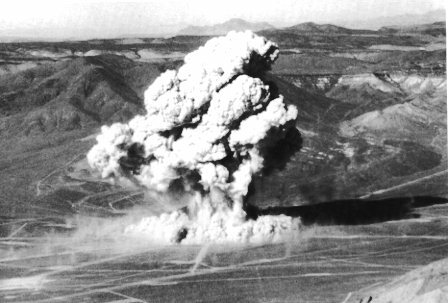 Since this shot was an airburst there was no local fallout, although some neutron-induced radioactivity existed. This was a test of the TX-7E , a Mk-7 bomb prototype. With a weight of only 1800 lb and a diameter of 30 inches this bomb represented a drastic size reduction over its Fat Man-size (10,000 lb, 60 inch diameter) predecessors. The design used an 800 lb. assembly of high explosive (primarily Octol 75/25), with a composite uranium-plutonium core. The predicted yield was 22-35 kt. This was a weapons effect test of a surface burst. Up to this time no surface burst had ever been fired (the fact that the center of the 60 inch diameter bomb was actually slightly above the surface later complicated attempts at analysis). 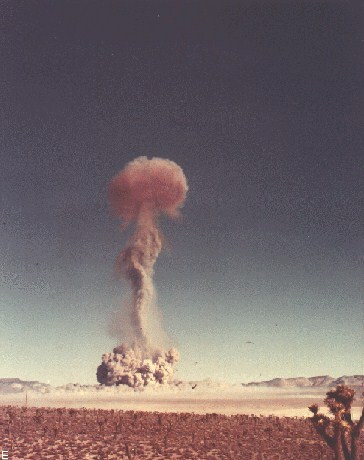 This was the only surface test ever conducted in the United States proper (although sub-surface shots were subsequently fired at NTS that produced surface craters). The device used (desigated "Johnny") was identical to the Ranger Able device, chosen for its predictibility and its limited yield (to minimize contamination). It was Mk-6 bomb using an all uranium core. The test name (Sugar) was a mnemonic code for "surface". The test left a crater 21 feet deep and 90 feet wide. 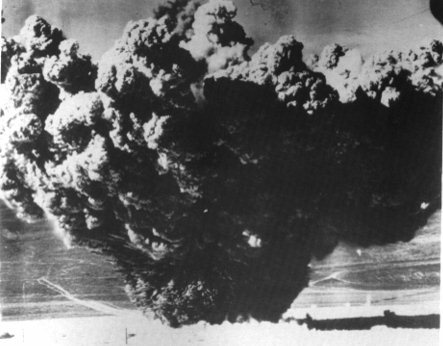 At this time an 83 kt surface burst implosion bomb was being considered for use as a cratering and bunker-buster weapon. 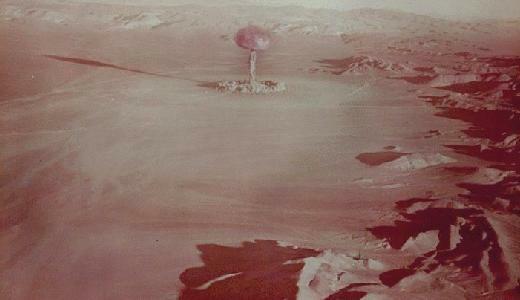 The test indicated that such a weapon would produce a crater 300 feet in diameter and 70 feet deep. Desert Rock II was conducted in conjunction with Sugar. 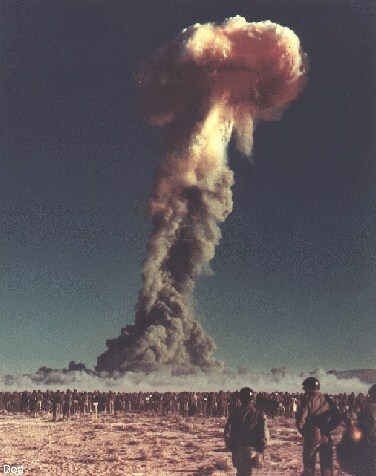 The troops observed the detonation at a distance of 5 miles. Due to the intense local radioactivity from the ground burst, the maneuvers were conducted at a considerable distance from ground zero. This was a weapons effect test of a sub-surface burst. The device used (desigated "Frankie") was identical to the Ranger Able device. The test name (Uncle) was a mnemonic code for "underground". The test left a crater 53 feet deep and 260 feet wide. The 17 foot depth of burial was designed as a scaled down test of a 23 kt ground penetrating gun-type weapon also being considered as a cratering and bunker-buster weapon. The test indicated that such a weapon would leave a crater 700 feet in diameter and 140 feet deep. Desert Rock III was conducted in conjunction with Uncle. As with Sugar, the troops observed the detonation at a distance of 5 miles and did not closely approach ground zero. Near ground zero the radiation level was 5000 roentgens/hour at one hour after the test, with levels of 1000 R/hr extending up to 1200 yards from the burst point. Hazardous levels of 100 R/hr extended past 5000 yards in some areas.